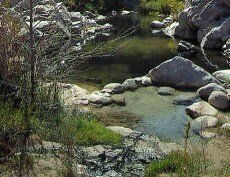 Never been to Gaviota Hot Springs, so I visisted on Friday. This was a real treat! Beautiful lush natural setting, sulfuary smell, but not bad, smallish warm pool, could hold 6 maybe. Great for a summer morning and I had the spot to myself for over an hour. The birds were having lots of fun, every bird "chirp" and "song" imaginable.